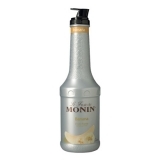 Monin yellow banana syrup in stylish 70cl glass bottle. 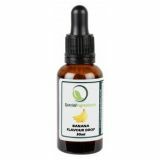 The most commonly consumed fruit, yellow banana is a sweet, mellow fruit with higher sugar concentrations than the unripe green banana making it less starchy. It is the fruit of the largest herbaceous flowering plant. Applications: Coffees, Flavoured milks, Cocoas, Dessert drinks, Smoothies, Cocktails, Beers, Fruit punches. Taste: Strong nose of ripe banana; velvet banana flambe taste. Sugar, water, flavouring. 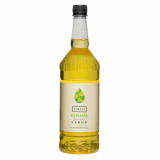 Contains banana extract.